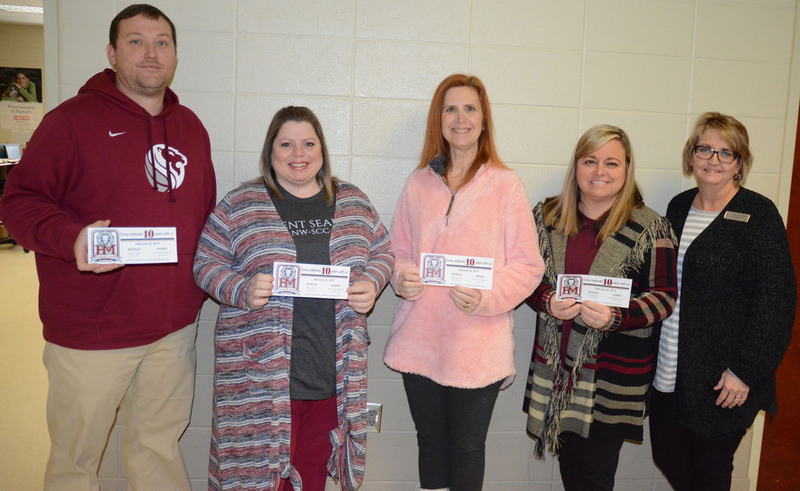 Teachers who have been with Haleyville Middle School since its opening 10 years ago, get ready to celebrate the special occasion on Tuesday, Feb. 26. The public is being cordially invited to attend this special event. From left, Dusty Ball, Renea Allen, Amy Farris, Susanne Trallo and Assistant Principal Tammy Hatton. HALEYVILLE - The date Feb. 26 will commemorate a special occasion at Haleyville Middle School in celebrating the 10th anniversary of the school, as invitations to past and present administrators, board members and other special guests are being sent out for an assembly commemorating the occasion. The special event will start at 9:15 a.m. Tuesday, Feb. 26. with a reception for past and present school and city officials in the middle school library. The assembly will follow the reception at 10 a.m. in the gymnasium. All students at the middle school, comprising grades 6-8, along with the public and special guests will be in attendance of the special assembly in the gymnasium. Special seating will be provided for the guests, including HCS Superintendent Dr. Holly Sutherland, along with immediate past superintendent Dr. Alan Miller and Dr. Clint Baggett--who was superintendent when groundbreaking was held for the middle school in 2007 and when the school opened in February of 2009. Dr. Baggett recalled that after several years of financial and facility planning, officials broke ground to build the middle school in September of 2007. Dr. Baggett expressed pride in being a part of the leadership of the middle school project. Dr. Baggett recalled that during his tenure as superintendent, they strove to make sensible and important steps towards improving the quality of education for the community, especially the students. “The construction of Haleyville Middle School was another jewel addition to our outstanding system facilities,” Dr. Baggett added. Invitations are being sent out for present members of the Haleyville Board of Education to be joined by past board members who were involved in the groundbreaking, construction and grand opening of the school. Board Members during the planning and financing of the school were Royce Benefield, Larry Burleson, Mark Butler, Sandra Manasco and Barry Tidwell. Members during construction were Burleson, Butler, Boo Haughton, Manasco and Steve Stott. Attending the 10 year celebration will be HCS Employee David Albright, representing his father, the late Larry Albright, who was mayor of Haleyville during the groundbreaking, building and opening of HMS. Also in attendance will be present Mayor Ken Sunseri and council members. City council members back at the time the school was built included Tim Edwards, Bobby Jack Fuller, Barry Warren, Jimmy Elliott and Johnny Frazier. State officials confirmed to be in attedance, as of press time, are Representatives Tracy Estes and Proncey Robertson. Estes noted he was honored to have accepted the invitation to attend this milestone event. “Education is obviously very important to the Haleyville community, as it has a history of supporting public education,” Estes said. Estes was referring to when Haleyville became a separate city school system, apart from Winston County in 1971. “This (10 year anniversary) should be one in which our community takes pride,” said Estes. Robertson noted he was encouraged about the work he sees in local school districts as he travels across his House District 7. “Haleyville Schools are always a shining example of what public education can and should be across our state,” said Robertson. “I’m looking forward to meeting so many of the former community leaders who had the vision and leadership to create what is being done here today,” Robertson added. During the assembly, Middle School Principal Bo Wilcoxson will introduce all special guests and give a history of the middle school’s past 10 years. Dr. Sutherland will give a look ahead to future plans for the middle school. Mayor Sunseri will also give comments on how the middle school has benefitted the city. “We’re excited about the 10 year birthday of our middle school,” Dr. Sutherland said. “This just gives us an opportunity to highlight the great things that are going on here and also to recognize those people who were foundational in building it and in the planning process, especially the city for all their support of our schools and their support when we built the middle school,” Dr. Sutherland added. “We welcome everyone back and we’re just excited we have this opportunity to show off our middle school,“ she said. A new middle school logo designed by middle school teacher Renae Allen will be unveiled during the ceremony, school officials said. “We just think it’s a neat milestone that our school turns 10 years old on Feb. 17,” Wilcoxson noted. “We will not only celebrate our school being here that long but we also want to celebrate and let everybody who has been involved in the past and now celebrate them and let them know how much we appreciate what they have done for us,” Wilcoxson added. The middle school building marked the first time in the history of HCS that grades 6-8 have had a total separate environment from the high school, using their own cafeteria, gymnasium and separate grade level hallways. Three teachers who have been at the middle school since it was built, shared special memories of moving into a new world as well as highlights of the past 10 years. “It doesn’t seem like it’s been 10 years,” noted teacher Amy Farris. Susanne Trallo recalled the day teachers first entered the middle school. “We were excited because we had space and technology,” she said. Before the middle school, Trallo taught in what was known for years as the 7th/8th grade building which is located on the high school campus. However, teachers recalled that school was cramped with small rooms and hallways, making it difficult for a lot of students being in the hallway at the same time. Farris recalled they were not used to such modern technology as was in the new middle school with lights coming on automatically. “We had good heat and good air that stayed on 24/7,” Trallo noted. The past 10 years have been better on both teachers and students. “One of the main things was separating a 7th/8th grader from the older 9-12,” noted teacher Renae Allen. “They had their own identity,” Farris added. “It’s a separate space for them. They were a little bit too old to be considered elementary, but there not old enough to be considered high school yet. “It’s a big deal to get to come across the street from the elementary school, but they are not ready to cross the street again to the high school,” Farris pointed out. As the school preparess for its 10th anniversary, Allen noted she was among the few teachers who have been at the school the entire time it’s been in existence. Farris came to the middle school from the high school setting. “We have four teachers who have retired from here, and we’re inviting them and past and present administrators,” said Wilcoxson. Wilcoxson, who was hired as middle school assistant principal in 2012, was named interim principal that year and later in 2013, as principal. Wilcoxson describes the journey the past 10 years with the major mission of giving middle school students their own identity. The middle school has gone great strides to establish their own identity with their own testing, band and even sports programs, school officials said. “For the longest, we were kind of like a small brother or baby brother to the high school, so we’re trying to leak off and get away from them and be our middle school, trying to start our own traditions and give us our own personality down here,” Wilcoxson continued. School officials are proud of the middle school facilities, with students seemingly taking pride in their surroundings as well, they said. Students leave 5th grade at the elementary school and venture into 6th grade into a whole new world at the middle school, where they have their own lockers and change classes with bells. “They will learn responsibility,” said Wilcoxson. “With a little more freedom they have, comes responsibility. “So our students learn, starting 6th grade, when the bell rings, you have four minutes to do what you need to do to get to class,” noted Wilcoxson. This, along with their own environment, will help prepare them academically and athletically for when they leave after 8th grade for the high school environment, Wilcoxson indicated. “Our goal basically is to prepare them for high school, academically, socially, all of that we are preparing them for the high school,” he said. The HMS building project was supervised by the Alabama Building Commission with McKee and Associates as architects and interior design and Volkert Associates Inc. as construction managers.